It's that time of year when every day brings something new to the market! We started picking field flowers a few days ago, and while the early morning rain blast knocked some down, they will be back and better by tomorrow. Sugar Snap Peas are being picked, and there's a HUGE crop of shelling peas just waiting for a few days of sun to finish ripening them. The squashes are perfect for grilling this weekend, too. Mj's kitchen crew made the first farm-grown, farm-made gazpacho last weekend, and they plan on having it available every weekend. 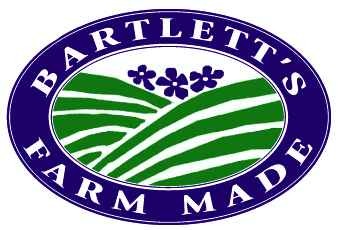 The Farm-Grown and Farm-Made labels are put on items in the market to let you know that those products are the finest you can buy. One farm label is very good. But when a product (like the gazpacho) carries both labels, that is a special treat. Look for more farm-grown, farm-made salads and 'to-go' foods in the kitchen counter as more produce is harvested. For lunch, you can get a Farm-Philly Cheesesteak, or a freshly grilled burger to go! There are plenty of 'grab-n-go' sandwiches and beach food in the case around the corner from the kitchen counter. These 1/2 pound burgers are specially blended for us with a combination of ground chuck and brisket. Rich, our Grocery Manager, says they're the best burgers he's ever tasted. 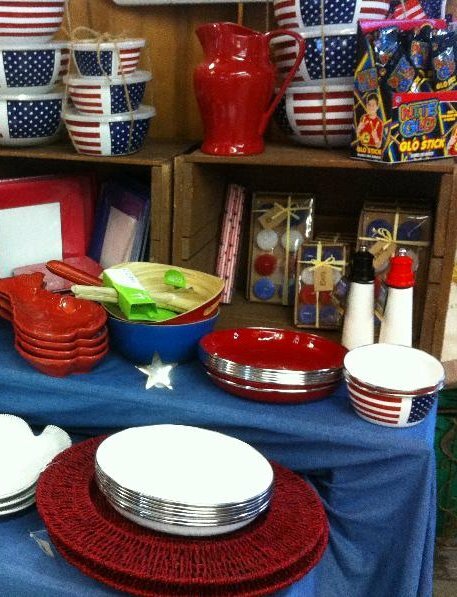 Red, white and blue abounds in the market...from combination packs of red, white and blue potatoes to checkered table cloths, napkins and other table decorations. Nantucket Fresh Catch will be selling locally caught fresh fish in the parking lot here at the farm beginning tomorrow, Thursday, June 30! Owners Joan Skar and Jeff Henderson will be providing fish from the Ruthie B and from local fluke and striper boats. You can find them in the lot Thursdays, Fridays, Saturdays and Sundays from 12-6. The July Full Moon Dinner is July 15. Make your reservation here. 9-1pm. 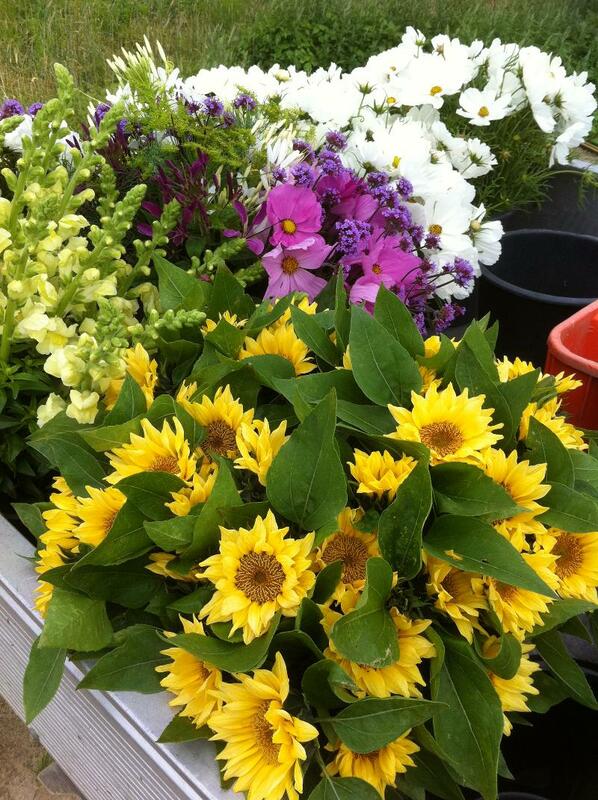 Farmer John is at the Nantucket Artisans and Farmers Market every Saturday, too! 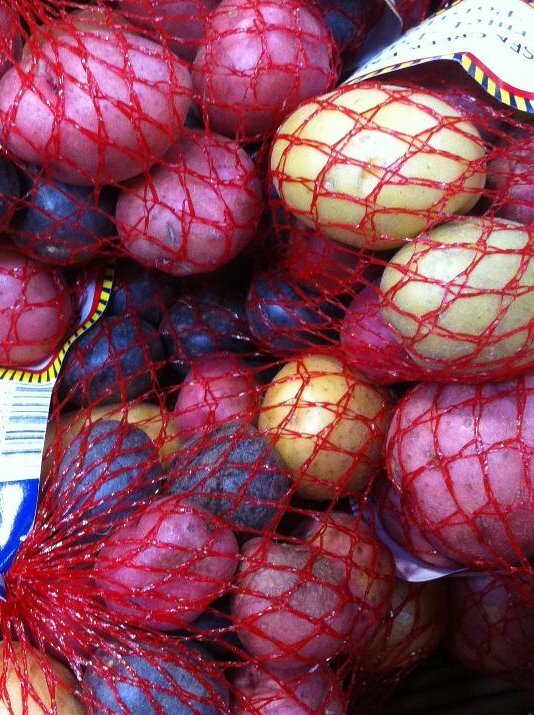 The 'Sconset produce truck will be in 'Sconset every day except Sunday! 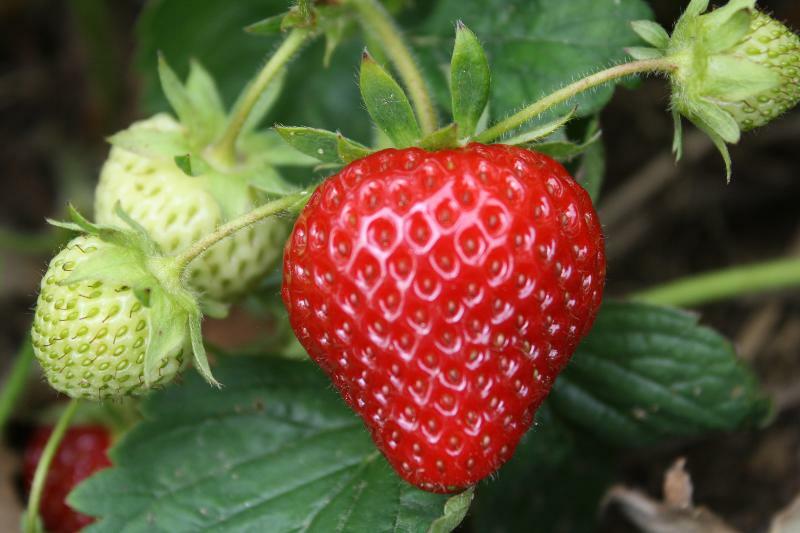 Farm Tours are going on in June and July on Tuesdays and Thursdays at 9am. $10.00 per person for a 1 1/4 hour tour behind the scenes. Weather permitting. Tours leave from the front of the market at 9 am. join the photo safari below! Claudia will offer tips and instruction on using your digital camera while you enjoy the farm fields early in the morning. 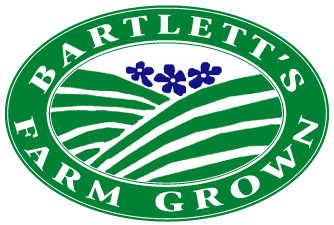 You will also be accompanied by Hilary Newell, who will answer questions and offer information about the farm fields and growing vegetables and flowers at Bartlett's Farm. We will provide all the boxes for picking.